I woke early this morning and it was just a short drive to Joshua Tree National Park. As you can see from the pictures, the park has some pretty unique plants. 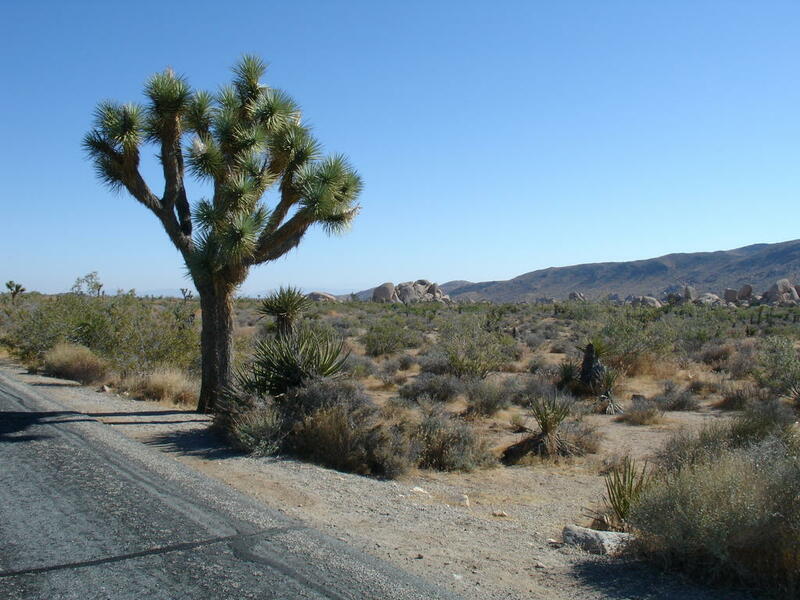 Oddly enough, these aren't trees or cacti, but actually they are more closely related to lily plants. Though the park was pretty big, it didn't allow for much walking around, so I decided to head North to Death Valley. To get to Death Valley I first had to drive through the Mojave National Preserve, which was pretty large, but only a small part of the entire Mojave Desert. I eventually got through it and arrived in Shoshone, CA, where I could get on 178W and head into Death Valley National Park. Other people have probably said this before, but you can see why it's called Death Valley after driving through it for just a little bit - it's hot, dry, and lifeless, except for some bushy-type plants scattered around. I drove towards Badwater - the lowest point in the Western Hemisphere. At the cliffs at Badwater there was a sign marking "sea level," and you could see how much further below sea level you were at Badwater. It took a long drive to get to Badwater, and after seeing that I had seen just about enough of Death Valley. However, I still had quite a drive until Furnace Creek, from where I could eventually head west out of the park. 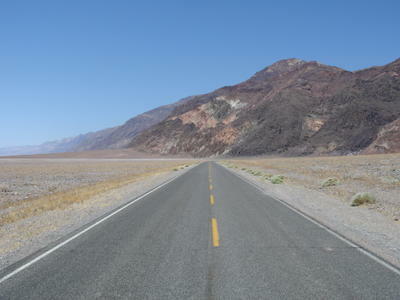 I had read that Death Valley is the largest National Park south of Alaska, and it's actually larger than the state of Connecticut, so it would take me still quite a while before I would be outside of the park. Heading west, traffic was a little slow as there were vans parked all along the shoulder being used as support vehicles for "Ultra-Marathoners." There were probably 50-75 runners I saw while leaving the park, though most of them were walking (I can't blame them - it was 119 degrees in Death Valley today). The runners wore protective gear to avoid getting burnt and they were given a lot of water at frequent intervals, but I still couldn't believe they'd run here, of all places, which can be one of the hottest and driest places on the planet. I drank over a gallon of water just simply driving through the park. I had to drive up and through some mountains to get out of Death Valley, which took a while. But after getting near the top, you could look back and actually see how low Death Valley actually is. 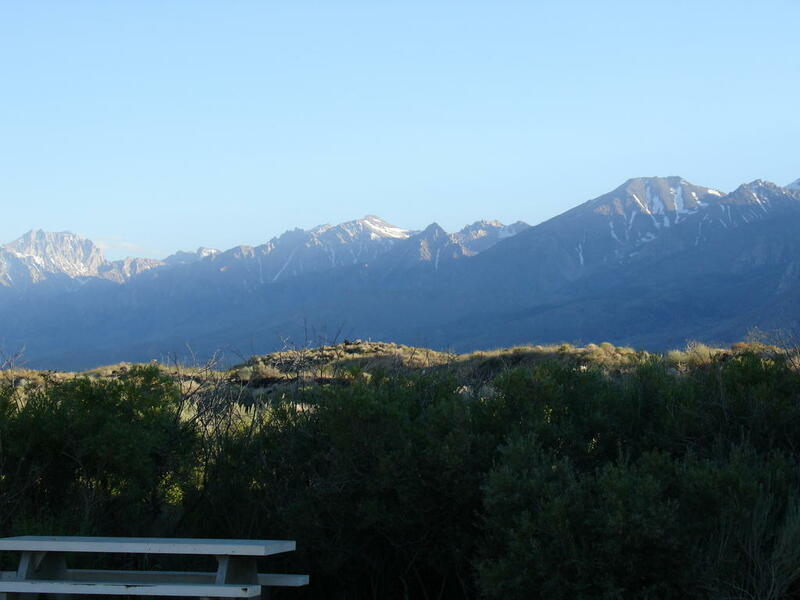 So I finally made my way out of Death Valley and when I was coming down the other side of the mountains I saw in front of me the Eastern end of the Sierra mountain range. Now, I had thought the mountains I saw around Death Valley were impressive...they were nothing commpared to the Sierras, whose peaks were at cloud-level. As it was only about 6pm at this time, ideally I would have visited King's Canyon/Sequoia National Park, which, as the crow flies, wasn't terribly far. However, I learned on my map that the only entrances into the park are from the West, and I was on the Eastern side. I didn't want to have to loop all the way around to get to the park, which was pretty big, so I decided I would head North to Yosemite National Park, which I've heard is pretty impressive. I'm probably 150 miles or so outside of the eastern entrance to the park, but I'll get there tomorrow morning and spend a couple days. From there, on towards Sacramento to visit my brother Mike. Thanks for hanging in with the sometimes slow-updating. Sometimes I'm lucky and I find scattered Wi-Fi hotspots, but not too often.